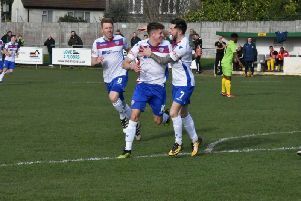 AFC Rushden & Diamonds could move into the play-off places in the Evo-Stik League South Premier Division Central if they can pick up a third win in a row this evening (Tuesday). Diamonds head to Banbury United having moved up to seventh in the table following their 3-1 success over bottom side Bedworth United at Hayden Road on Saturday. Andy Peaks’ side have impressed in their debut season at Step 3 and are now making good progress up the league standings. And while the Diamonds boss knows his team will be in for a tricky test in the first of four successive away matches, he insists his players have shown they can compete with anyone. Banbury currently sit in 15th place in the table. And Peaks said: “They are a team who are probably a bit disappointed with where they are at the moment. “They have got better players than their league position suggests but they got a good point at Coalville at the weekend and they will be looking to follow that up. “But from our point of view, we aren’t too concerned with our opponents.